This was a high price to pay for this fairly common foil diecut. They surface regularly. 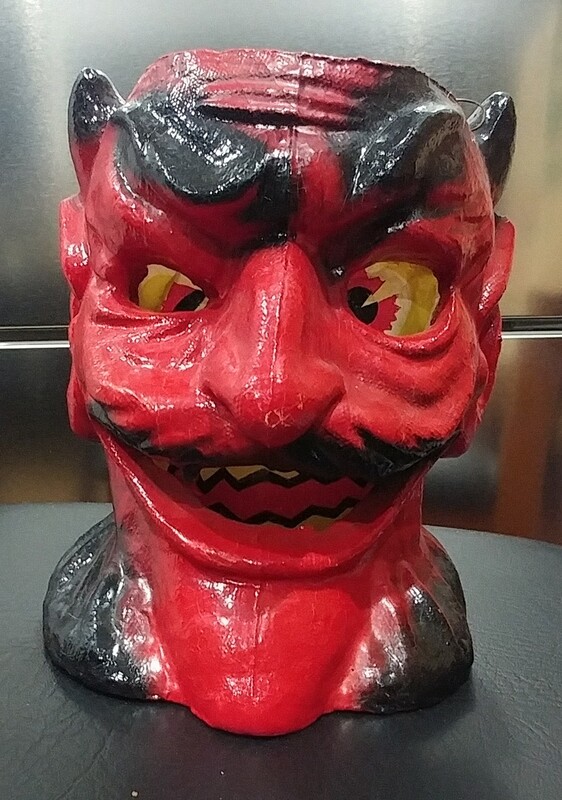 This devil was produced by Happy Holiday of Battleboro, Massachusetts during the late 1950s and into the early 1960s. They typically change hands for $30-40. Foil items have not been a strong market segment for many years - if ever. Is that changing? More selling data points will tell the story. At this point, I feel this result is an outlier. Here's a great Beistle item you don't often see. This was issued for the 1931 season only and marketed as a Lightning Wumpus, one of four large jointed designs Beistle issued. They issued two in 1929 and two in 1931. (You can see them all on page 146.) This is one of their two best, the other being the scowling Skairo. This one appears to be in remarkable condition given how much can go wrong with this large item with its wholly irregular edges. SGV is $525. 06/24 Update: This seems to be a slow time for quality listings - and when they do surface, the results, at least in this case, have to be disappointing. This stellar item sold for well below SGV. It brought $407. The buyer must be on cloud nine. I've seen these oddly colored devil head lanterns occasionally over the decades and remain unimpressed. They just don't have the impact the traditionally toned ones have for me. I do believe F.N. Burt made these with varying odd colorations, probably late in the overall production run. As with all inserts I haven't examined personally, I assume it is newer. Sustainable guide value for this lantern with a typical look is $350. I can't imagine, even during an optimal listing time, that this would get more than a fraction of that value, even if it didn't have a carved bottom. 01/19 Update: This brought $153.50, a bit more than I would have guessed. This magnificent lantern leviathan is a true showstopper. While I was scrolling through the listings I couldn't pass it by, the imagery is that strong. These huge lanterns were store displays and were made right around 1919 and then for 1-2 more seasons. I have seen three designs over the years - this devil, a witch head and an eerie JOL. I can count on one hand the number of times I've seen this lantern. These are so rare that lantern collectors should be scrambling to be the prevailing bidder. I'll be watching! The bonus here is the seller, an honest person who strives to be correct in her listings. It would be hard to find a nicer seller. 10/02 Update: This superb item sold for $2,550! It is satisfying to see some real treasures amongst the dross that makes up this eBay category! I have seen this non-embossed diecut come available only a handful of times in my nearly 30 years of collecting. This diecut was produced by Beistle during the mid-1920s. There is a somewhat slightly more common variant Beistle produced without the tail, but I find it less interesting. The condition issues the seller conscientiously notes aren't concerning. If you appreciate iconic Beistle imagery, don't let this great piece slip by. I like the design so much I've included it in the Inner Sanctum section of the 3rd edition with a guide value of $325-375. 09/05 Update: This sold for an astounding $922! Looking at the bidding history, there were at least 7 different bidders who pushed it beyond guide value, indicating that that value may be much too low. This is a common diecut in uncommonly good condition. Nonetheless, the seller's start and BIN prices are the very definition of optimistic: $462.46 and $1156.16, respectively.